Ceremonies are key ways to integrate teachings and accelerate personal growth. The Red Lodge Longhouse program includes ceremonies such as sweat lodges, flowering trees and others both in nature and inside the teaching experience. A ceremonial week is held each year where students camp out together in nature and complete some powerful, personal and group ceremonies. Purification Lodge ceremonies are part of the Red Lodge experience. We enter the Lodge, (a dome like construction mostly made from She Oak here in Australia). 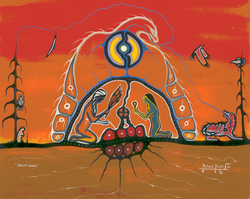 In the Sweet Medicine Sun Dance path the Purification Lodge is primarily considered to be the ‘Womb of Grandmother Earth’. The structure is considered the Feminine, receptive creative energies of the Universe. The Masculine, active conceptive energies of the Universe are represented by the altar and Spirit Path from the rock pit across the altar to the fire pit. The Purification Lodge is an alchemical tool that holds the presence of the 5 elements - Water, Earth, Wind, Fire and the Void and the presence of the 5 worlds - Minerals, Plants, Animals, Humans and Spirit. We, human beings work with them as the determiners of energy. The purification ceremony offers us an opportunity for prayers for self, life and others, for healing and teaches us that ‘death gives life’. There are also community sweats held each month in the Byron Bay Area. If you are interested in joining us please email. ﻿Eagle Dance is a one day ceremony in which the participants dance to the “Tree of Life” with the intent of manifesting through dance and prayer Health, Prosperity and Abundance for Self, Life and Others. It is an annual ceremony where we dance our intent for the next year in all areas of life -to bring balance and beauty to our lives; to engage with ourselves and hear our own prayers. The prayers are carried to the “As Above” through the branches of the tree and return to us from Great Spirit through the tree, so as we dance we activate and strengthen our personal and sacred dreams. The drum beat and songs carry us through the dance with their heartbeat. It is a magickal empowering event and indeed a dance of renewal, every year! EAGLE DANCE IS ALSO OPEN TO FAMILIES AND FRIENDS OUTSIDE OF RED LODGE.